A huge help to me in getting started in the world of football X’s and O’s and understanding the game’s strategies and developments was reading Chris Brown’s “Smart Football” website and then his Grantland column. He was good enough to send me a free copy of his second book which along with his first catalogue a lot of his main columns and historicals over the years. Everytime someone asks me how to learn more about the game I direct them immediately to these resources. I recently wrote a column explaining why blue blood programs were turning to running QBs to offset the egalitarian effects of the spread offense. 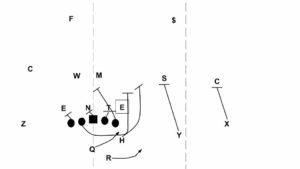 One of the key features is that teams are learning that any good, classic run scheme can be adapted to the spread if you leave a defender unblocked and attach a QB run read. Oklahoma is actually one of the better examples of this since they’ve built their Samaje Perine/Joe Mixon run game over the last two years largely around “counter-trey” which is hopeless without backside constraint. It’s basically the power-read but run to the same side as the RB so the QB reads the DE and instead of handing off to a sweeper or keeping he’s either pitching the ball wide or keeping. I noticed Stanford running it a year ago, it’s pretty devastating. It’s particularly hard, as Chris notes, on teams that want to defend the power-read by having the DE play wide contain and forcing the ball back inside to the linebackers. How are you beating the RB to the edge on a pitch? For teams that want to spill the ball it’s still tricky as the play side backer who’s scraping wide to make the tackle now has to deal with chasing a pitch rather than a sweep. Creating cover downs wide and good support fits from the safety are now more important than ever on defense. I also think we’ll see more teams abandon the idea of trying to always find the prototypical 6-3, 240 pound enormous freak to play linebacker and happily take on more scrappy, 5-11/6-1 fireplugs that can run laterally. Evans will be the only ILB on the field that isn’t a shorter, stouter guy and he’s on the field because Shaun Dion Hamilton (6-0, 232) tore his ACL earlier this year.